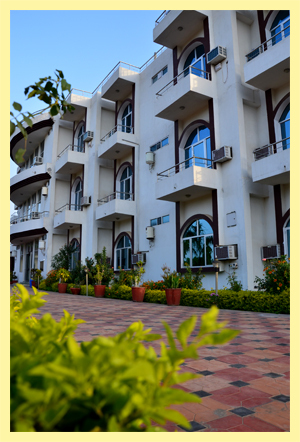 Hotel Siddhi Vinayak Resort, Ranthambhre is a luxurious deluxe hotel in the heart of the Tiger city. The hotel blends traditional Indian hospitality with modernism. It unfolds not only ethnic interiors but also the exotic and royal style of living. There are 04 Super Deluxe and 34 Deluxe Rooms are luxuriously furnished and feature latest technology with focus on comfort and convenience along with comfortable/ larges beds. All rooms are centrally air conditioned. Each room is equipped with modern amenities. There is power backup generating unit in case of electricity failure. We excel in professional yet personalized service to our guests. Hotel Siddhi Vinayak Resort, Ranthambhore invites you to discover "Ranthambhore National Park, a famous wildlife destination in India". The hotel offers global travelers a host of world class leisure and business facilities to make your stay comfortable.